Lean Six Sigma for Leaders presents a no–frills approach to adopting a continuous improvement framework. 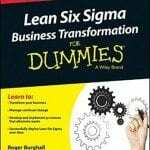 Practical, down–to–earth and jargon–free, this book outlines the basic principles and key points of the Lean Six Sigma approach to help you quickly determine the best course for your company. Real–world case studies illustrate implementation at various organisations to show you what went right, what went wrong, what they learned and what they would have done differently, giving you the distilled wisdom of hundreds of implementations with which to steer your own organisation. Written from a leader′s perspective, this quick and easy read presents the real information you need to make informed strategic decisions. While many organisations have implemented either Lean or Six Sigma, there is a growing interest in a combined approach; by implementing the most effective aspects of each, you end up with a more potent, adaptable system that benefits a wider range of organisations. This book shows you how it works, and how to tailor it to your organisation′s needs. In theory, every organisation would like to attain continuous improvement but what does that look like in day–to–day practice? How is it structured? What practices are in place? How can you implement this new approach with minimal disruption to daily operations? Lean Six Sigma for Leaders answers these questions and more, for a clear, actionable guide to real–world implementation. Lean Six Sigma for Leaders is available on Amazon.